The Fall season is in full swing and with it comes the need to create even more new designs to accommodate the upcoming holiday shopping season. I do have MANY new pieces to picture and get added to the site, but I felt it important to get my website updated a little. I have found over the course of the year that many people (shoppers) did not know I do custom jewelry work. I have always done custom work and my website reflected this at one point -but when I changed the site earlier this year, I also had to recreate all the pages and I'm still working on that. Over this past weekend, I updated the main site to highlight some beaded jewelry pieces that reflect the Fall Trends in both style and color. As well, I added some neat sections that highlight the other work I do. Whether you are looking for a stand out necklace, bracelet or pair of earrings for your work wardrobe or a special occasion, right down to the last detail, I'll work with you to design a piece you'll treasure for a lifetime! Specializing in Custom Bridal Jewelry, Custom Bridesmaid Jewelry, Custom Mother of the Bride Jewelry, Custom Flower Girl Jewelry, Custom Prom Jewelry, Custom Special Occasion Jewelry. The Crystal Ice Collection is not necessarily *new* but I did want to keep it highlighted, especially with the upcoming holiday season. The jewelry from this collection are fantastic pieces that add a little (or a lot!) of sparkle to your holiday parties, new years' eve bashes and even winter themed weddings! Gift certificates make the perfect gift! We've always offered them, but again, with the upcoming holiday season, it can be tough to decide the perfect gift for a friend or loved one. Let them shop for exactly what they want. Gift certificates are easy to redeem and allow the recipient to get their perfect jewelry gift! It's never too early to start your holiday shopping! With today appropriately being the first official day of Autumn, it was fitting to announce the new Fall Beaded Jewelry pieces have begun to be added. Whether you lean towards the trendy or traditional side, you'll find the perfect accessories to complement your fall wardrobe at Crystal Allure Jewelry. For you fashion forward gals, you'll find handmade beaded jewelry in this seasons hottest colors like burnt orange and Caribbean blue. Both of the following one of a kind beaded necklaces are the perfect complement to your fall wardrobe. Just because it's Fall doesn't mean you can wear a blue reminiscent of summer! This next necklace is a warm blue, so it'll fit right in with your fall/winter wardrobe. If you are more the traditionalist, you'll find elegant beaded jewelry in the traditional rich autumn shades of red, brown and gold. No matter your preference, the one color that will always be in style and remains the color for Fall 2008 is purple! Find all of these pieces and more Fall Beaded Jewelry at Crystal Allure. I just love this new Polyvore tool! Of course, I'm still learning how to work with it and how to create a fantastic 'collage', if you will. But, I think I'm doing pretty good. What do you think? 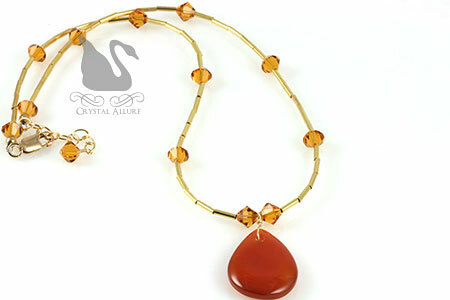 Today's feature friday is Crystal Harvest, which features our gold-dipped leaves combined with Swarovski Crystal Copper. With autumn approaching next week (yikes!) already, it's a fantastic time to start thinking about our own fall fashions. If you are interested in the outfit shown, you can get that at Chadwicks.com. As much as I love some of the high-profile fashion designers, I'm the typical "average woman" and as such, I look for things that are classic and work with everyday style (but has a little bit of, shall we say, "sparkle"). 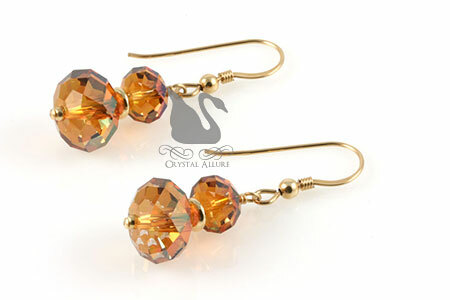 These handmade crystal earrings are designed with both an 8mm and 12mm Swarovski Crystal copper rondelles accented with 14 karat gold fill beads and ear wires. Beaded earrings are 3/4" in length from the bottom of the ear wire. 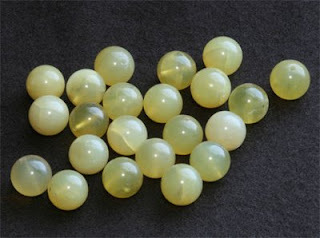 And coming next week, new Fall Beaded Jewelry Collection pieces will be posted, so keep checking back. Are you new to jewelry design? And looking for fantastic bead sales? After many years in the business of jewelry design, I have accumulated a lot of beads! Let me help you get started, while you help me get rid of some beads. These are simply supplies that I am no longer offering in my designs, orphans, or strangly enough, just cannot come up with a use for them. But maybe you can! Get quality materials at cost or below -it's a win-win! Go to my Etsy shop of jewelry supplies on sale at crystalallure.etsy.com or click on the Etsy image in the right hand column. I happened to find this pretty nifty Polyvore tool that lets you upload clothes, accessories and more to your profile. You can then you can mix and match until your hearts content! I thought this would be a great tool to feature some of our beautiful Crystal Allure Beaded Jewelry pieces with fabulous outfits. Since this was my first go at it all, I tested the tool on the following Swarovski Crystal beaded bracelet and crystal earrings. The black and white formal gown was found at Chadwicks.com and the beaded crystal jewelry can be found below. It's hard to resist a shimmering crystal bracelet! Clear cubes of Swarovski Austrian Crystals make up this stunning go-with-everything handmade beaded bracelet accented with .925 Bali and finished with a sterling silver filigree pearl clasp. 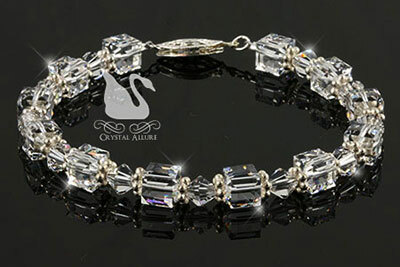 Crystal bracelet measures 7-3/4". These handmade beaded earrings are a petite 3/4" in length designed with Swarovski Crystal cube and bicone shapes, accented by bright .925 sterling silver Bali, wire-wrapped with sterling silver french ear wires. 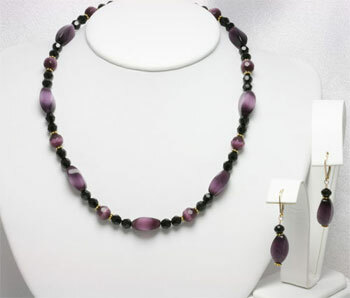 I'd love to hear your feedback on this Sophisticated Elegance Jewelry Set, just leave a comment below. 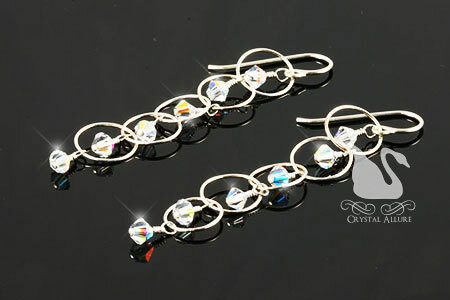 While visiting shop our SALE for great prices on Swarovski Crystal Jewelry. But, I actually took a break yesterday from Crystal Allure to learn how to crochet a certain blanket. I signed myself, and an Aunt, up for a class at a local craft store only because I saw a blanket square displayed that I really wanted to learn how to do. I am obsessed with baskets -LOVE 'EM (especially Longaberger) and when I saw this sample, it looked just like a basket to me and I thought it would look fantastic in my living room. So guess what the pattern was called......are you ready?....a BASKET WEAVE pattern! 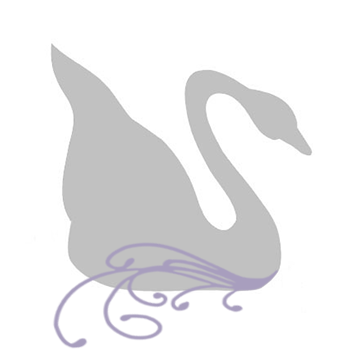 Now this sample is a little more ambitious with a border, I may or may not do that, but in general this is the pattern. I learned how to crochet when I was young, my mother and her cousin showed me how. Since then, I've crocheted a few simple blankets over the years (and the ever popular scarves) to give as gifts. Until recently, my mother always was crocheting something. She's done bridal dolls, blankets, scarves, you name it -she's probably done it. Because of hand problems she can no longer crochet and she had a few unfinished blankets that I have at home now. I will someday finish them, but I wanted to re-introduce myself to crocheting and do a few blankets I wanted first. Since learning how to crochet, as you can imagine, I got into many other crafts. One of which was cross stitch. I love to do it, but it just takes so long to do one project. Needless to say, I have one unfinished cross stitch gift that maybe by 2050 it'll be done. So much to learn and do, so little time. So, I'm excited to begin a blanket with this new pattern I've learned and it's perfect timing with the fall weather upon us. 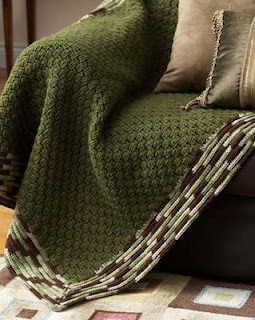 It's much easier to crochet a blanket when it's chilly out (and football is on). We'll see how quickly I can get this blanket done in addition to maintaining all the facets of Crystal Allure (and a personal life!). Stay tuned on the progress of this blanket. I recently came across a jewelry website offering designer jewelry. Curious, I looked around. What I found astounded me. The site, although designed very well, sold what is really costume jewelry, but at bridge or even fine jewelry prices. For example, I found a simply designed pair of acrylic drop style type earrings made with synthetic pearls and gold plated earwires and components -they were priced at $30! Outragous, to say the least. Anyone in the jewelry business knows how difficult it is to price your handcrafted jewelry designs, so that they are fair and competitive within the industry. But the key is to always adjust up or down depending on various factors (some of which include: materials used, design technique, complexity, availability, etc). You can apply a formula to your costs but you still need to adjust at times. That being said, if a plastic pair of earrings is worth $30 (as described above), then my jewelry is WAY under-priced. But clearly, I don't look at it that way. I have taken great pains to research my pricing strategy and competitiveness in the handmade jewelry market -that sells designs using similar materials. 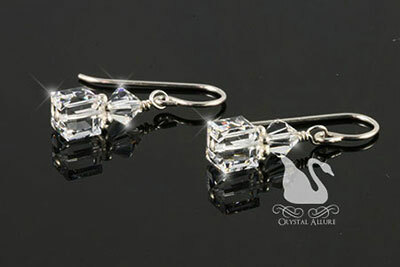 So, if you wish to get your ($30) dollars worth, shop Crystal Allure Jewelry where you can get a $29 dollar pair of handmade earrings designed using sterling silver, Swarovski Crystals and a delicate, feminine wire-wrapping technique, similar to the pair shown below. Shown above are a beautiful pair of handmade beaded earrings, 2-1/4" in length, designed with sparkling aurora borealis Swarovski Crystals gently wire-wrapped in a stream of sterling silver chain 'bubbles' with sterling earwires. For those of you that are in the jewelry business or just starting out, an excellent jewelry business resource can be found at Rena Klingberg's site, Home Jewelry Business Success Tips. There are hundreds of articles and tips from jewelry makers like you and me (including tips on pricing). Subscribe to her newsletter for updates and new articles. I am attempting to add more blue color to the jewelry collection and today's feature highlights two new beaded bracelet designs. Both these bracelets feature a vibrant blue faceted rondelle glass bead accented by Swarovski austrian crystal pearls and .925 bali beads. 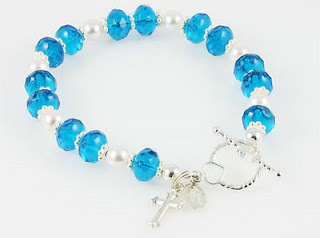 While making the Pearly Blue Cross Charm Bracelet (below), I felt compelled to add a sterling silver cross charm and I think it looks fantastic! 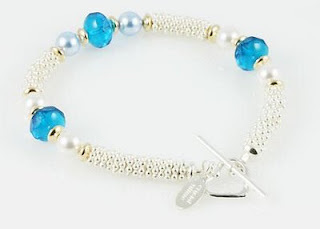 You'll find the Pearly Blue Bali Bracelet a little more subdued, but equally stunning. Today's feature showcases both these bracelets at a fabulous sale price, for a limited time only. Each beaded bracelet is a one-of-a-kind so hurry on over the the website and get yours before they are gone for good. Back to School, means more time to bead!! The kids are officially back in school! I can hear all you ladies cheering now (with tears in your eyes). Even my husband is taking classes towards his masters. Not that he has ever complained about the time I spend creating, I do feel quilty at times spending so much time with my beads. Almost feels like a love affair...with my BEADS! The only good thing about hubbie in class is I spend that one night focused on completing a particular design. 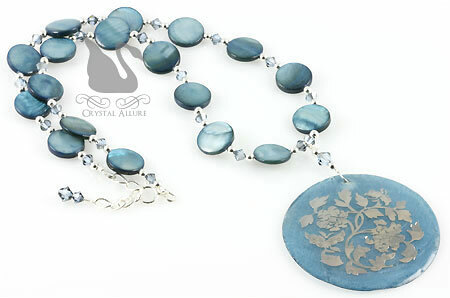 In this case, the result is this enchanting embossed indigo shell necklace, featured below. Handmade beaded necklace features an indigo blue shell pendant embossed with elegant silver florals and swirls, accented by blue shell discs, indian sapphire Swarovski Crystals and sterling silver beads finished with a sterling silver lobster clasp. Necklace is adjustable 17" to 18". I'm normally not a big fan of blue, but when I saw this shell pendant I knew I had to have it. Its' shade of blue is such an enchanting blue that I wouldn't even really know how to describe it. The picture truly doesn't do it justice. While creating this necklace, I realized I didn't really have much blue jewelry in my collection (again, probably because I'm not an overly huge fan of it). But, I did decide to be more conscious of it and try to incorporate a few more blue pieces for all you blue jewelry lovers out there. Blue truly is the perfect color for Summer Beaded Jewelry! 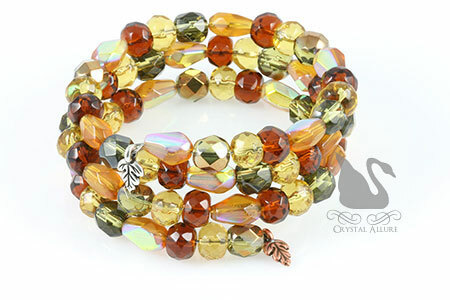 The best part about Crystal Allure Beaded Jewelry is we are open 24 hours a day, 7 days a week. So while your kiddies are at school (or sleeping), shop from the comfort of your home (in your PJs!) or from the office.